 Public Lab: Any way to improve on the DVD grating? Question: Any way to improve on the DVD grating? How are you dealing with the slit geometry and the curvature of the DVD grating? I have built a simple spectrometer using a Canon 1000d DSLR, a reversed 50mm lens that I normally use for macro photography and a DVD grating. The slit is about 2mm long and very thin (made by making a small cut in a aluminium foil with a very sharp blade). The problem is that even though I am basically getting a resolution limited by the CMOS sensor (I can easily resolve a sodium D lines), it's only in vertically thin slice of the image. It seems that a combination of a straight vertical slit and a curvature of the grating introduces an aberration in most of the imaged spectrum (see the sample). Does anyone know of a way of getting a sharp spectra using a DVD grating? I am guessing that I would get a sharper spectra using a point in place of a vertical slit but than I would sacrifice a lot of light. I would very much like to be able to use mote of the recorded image. I have even bought a cheap diffraction grating film in a roll. It does have a straight grooves but the film itself is not flat and I have not come up with a way of mounting it perfectly flat. 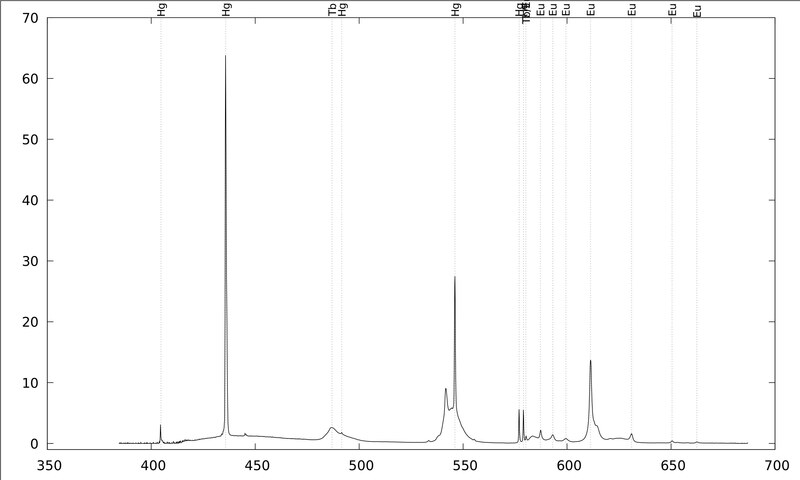 If it isn't completely flat, I get a completely unusable spectra. Any idea how I could mount it flat? That's a gorgeous spectrum, maybe the best I've seen from a DVD. Is there more information to be gained from using more of the spectrum? A single line of pixels will produce a spectral graph. I have had good luck with thin sheets of grating material, although that problem of flimsy sheets not being flat always bothered me. Have you demonstrated that the peaks from a standard source (e.g., CFL) are displaced when you use thin grating sheets? Do you ever see the 405nm mercury peak in your CFL spectra? It was always ephemeral when I used a DSLR to record the spectrogram. It's true that in ideal conditions a single line of pixels should be enough but if you want a high quality spectrum you certainly need more. To get a good resolution you need a very thin slit and that means that not much light gets through. Noise is then a huge problem, when dealing with a faint signals or a very large dynamic range. That problem can be solved either by longer exposure (I am currently forced to average multiple 30s exposures with a high ISO for faint sources) or by averaging pixels vertically (I can currently average about 20 pixels without apparent loss in the resolution, but 200 would be much better). And yes, using these kinds of 'signal amplifications' I can certainly clearly detect the Hg 405nm line, even though it's really on the edge of what the bayer filter lets through. If you want to see it on a spectrum plot, you really have to callibrate it properly. You have to divide you spectrum with a recorded spectrum of a tungsten lamp and multiply it by a calculated blackbody spectrum. My callibration is not perfect (specially at the edges) but it's still better than no callibration at all. Does anyone know what could be the source of the 445.1/445.8 lines? I can't identify it. The problem with the grating film was that I was getting a terrible spectral resolution, with all kinds of artifacts, because of the slight curvature of the sheet. I am currently trying to epoxy the sheet to a flat piece of glass. The problem is that if the epoxy is not of a perfectly even thickness it acts as a lens, randomly bending the light. If I don't use the epoxy but sandwich the grating between a two pieces of glass, then I avoid this lens effect but potentially get multiples of each spectral line caused by the internal reflections from the glass surfaces - a huge problem I was having when I was using a CD as a reflective diffraction grating.